Welcome to the Asian Financial Forum's annual cocktail reception. After a long day full packed with global financial intelligence and insight, I would say this is happy hour at its finest. Most needed indeed. Most fitting as well, given that we are celebrating the 10th anniversary of the Asian Financial Forum. And there is more to celebrate. The Forum has been named the first major event to commemorate the 20th anniversary of the establishment of the Hong Kong Special Administrative Region. With much more to come, all under the theme of "Together‧Progress‧Opportunity". Over the decade, the Forum has welcomed some 20 000 high-profile professionals from Hong Kong, the Mainland and all over the world. In recent years, about one quarter of the Forum participants are returning participants. And we believe they are returning for more than this celebrated happy hour and the connections it creates. They are returning - indeed you are returning - because of the continuing rise of Hong Kong as a financial services capital. And you are not alone in appreciating the opportunities that offers. Last May, the International Institute for Management Development named Hong Kong the most competitive economy in the world. The Swiss Institute also put the city at the top in financial efficiency. Not surprising in either case. Consider. Over the past decade, the Hong Kong stock market finished among the top five global markets for IPO (initial public offerings) every year. Indeed, it finished first in five of those years, including the past two. Raising an impressive US$300 billion over that decade. There are other ways of raising capital. Profitably. And Hong Kong makes it happen like nowhere else. Take, for example, our inaugural sukuk. The US$1 billion issue, in 2014, was the world's first US dollar-denominated sukuk packaged by an AAA-rated government. Hong Kong's financial services sector attracts a world of interest. Some 70 per cent of our asset management business comes from investors outside Hong Kong. Which means that our asset managers enjoyed a remarkable volume of new business over this past decade. Indeed, our combined fund-management business totaled about US$2.2 billion in 2015, almost four times higher than just a decade earlier. Hong Kong has captured the risk-conscious market as well. The insurance sector's annual gross premium income almost tripled, to some US$50 billion, between 2005 and 2015. Nowhere in Asia will you find a higher insurance density, per capita, than Hong Kong, which comes in at around US$6,000 per person. Then there is the Renminbi. With the support of the Central authorities, Hong Kong launched its offshore Renminbi business about 13 years ago. Today, we count the deepest, most liquid, Renminbi market outside the Mainland. Our Renminbi-denominated investor products are unmatched. China has been issuing Renminbi sovereign bonds to international investors through Hong Kong. Last month, the Ministry issued bonds totalling RMB 14 billion in Hong Kong, following a first-batch issue of about RMB 14 billion last June. Indeed, 2016 marks the eighth year in a row that the Ministry of Finance has issued Renminbi sovereign bonds in Hong Kong. No less important, Hong Kong has been first mover in securing mutual access between the markets of the Mainland and Hong Kong. The Shenzhen-Hong Kong Stock Connect, launched just last month, follows the launch of the Shanghai-Hong Kong Stock Connect in 2014 and the introduction of the Mainland-Hong Kong Mutual Recognition of Funds Arrangement in 2015. 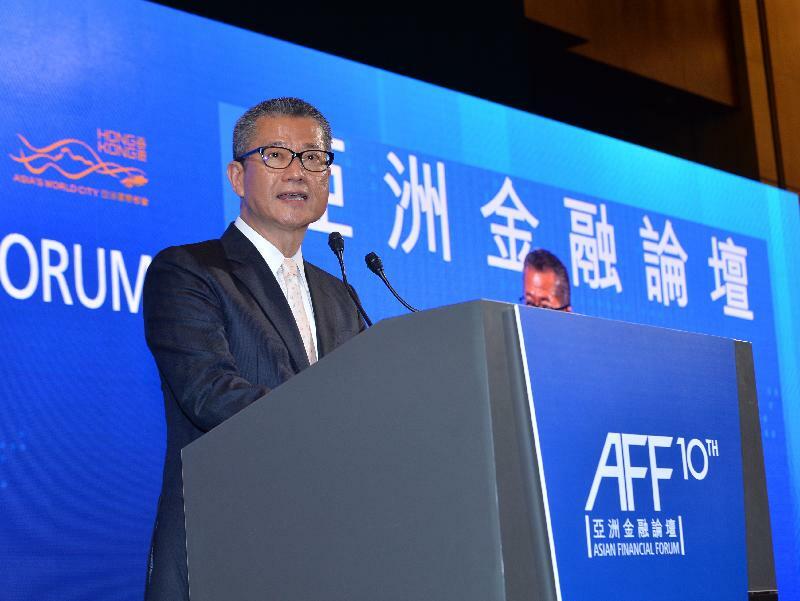 Under these access schemes, the cumulative net fund flow from Mainland investors to Hong Kong, combined with funds from Hong Kong and overseas investor flowing into the mainland, has realised more than US$70 billion since their respective launches. Hong Kong's singular role in the two-way opening up of the mainland's capital markets will continue to grow. Continue to create opportunity for Hong Kong, for the Mainland, and for a world of finance and commerce. Indeed, Hong Kong has the capital, the connections, the products and the expertise to serve as the financial and investor services hub for the Mainland's Belt and Road initiative. Encompassing some 65 nations spanning Asia, Europe, the Middle East and Africa, the Belt-Road is perhaps the 21st century's most ambitious multilateral undertaking. And Hong Kong will take very good advantage of it - of that, I can assure you. And finally, ladies and gentlemen, I would like to wish you the best of health, wealth and happiness in the Year of the Rooster. Enjoy the rest of the evening. Thank you.